First let me make an abject apology to the entire Cuyahoga valley for having a complete psychic meltdown on the front row Tuesday night. I told myself I would remain in control...adopt a reserved and cool demeanor...maintain a level of dignity consistent with my status as an adult. Folks, I completely lost it! 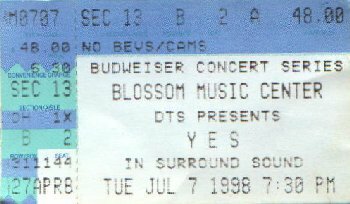 Its been 22 years since I saw my first Yes show, and it took that long to reach the front row. Such an awesome experience! The energy was flowing off the stage like molten lava washing over wave after wave of electric ecstacy soaring vocal and instumental passages leading to that moment of full gnostic union with the Source.....Oh YES!!! My oh my I was a flapping drooling fannboy up there! Pounding the stage as Squire served up the steaming plate of Whitefish mere inches from my face...yum yum!...My brain shredded my Steve's razor edged slide guitar into salad tossed with lots of syrupy Koroshev Russian dressing...quite a feast for the soul, Yes indeed! But the best was JON. Is it just me or does he not have this radiant aura? not just the angelic Voice, but something like a glow that manifests itself around him...I expected any moment for those wings to unfurl and see him rise up from the stage and lead us all home to the Light! and indeed he did, at least metaphorically. I lost my fear and cycnicism for a little while there, on the front row...bouncing with joy that here was Something Special that was still here for us...Thank you Yes for being in the world and bringing a touch of the transcendant to us and reminding us of the place we love to be...Together!! in a spirit of Peace and Joy and Wonder. It's All Good!!! PS...Thanks to all the good people I've met on my little roadtrip this time, and special hello to the divine miss "m" who I was so happy to meet and share front row boogie with...next time we really will boogie bounce Jon off the stage!!... :-) See Ya!! Well, I saw the show last night. It was very good, atually very similar to the first leg of the tour. Form where I was sitting (about 25th row left of center) I didn't notice the surround sound at all, although I did see speakers near the back. Do you have to be dead center to hear this thing? The sound didn't seem improved much from the fall, although it was very good.